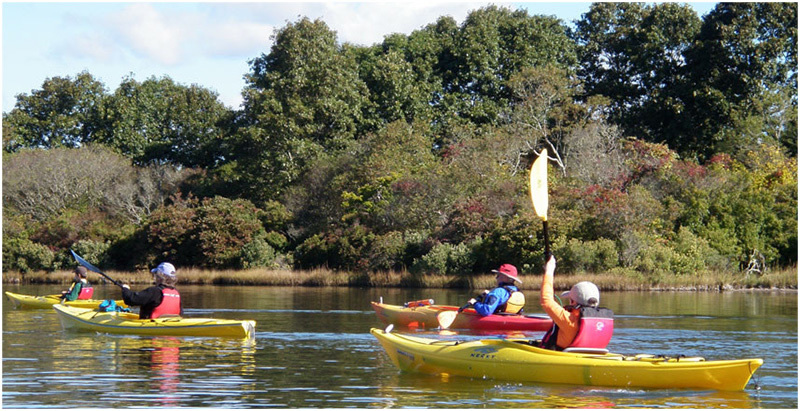 The southern RI salt ponds are wonderful places to paddle. Please join us for some exploring! Please arrive at least 30 minutes before the launch time. We require that all paddlers wear life jackets and provide their own equipment. Trips may be cancelled without notice if the weather conditions are unsafe or particularly unpleasant. Rain dates for the daytime (Saturday) paddles are the next day, conditions permitting. Please contact us at saltpondscoalition@gmail.com (or call 401-322-3068) if you have any questions. All paddles are free of charge but please email Liz@joinsaltponds.com to register. Lauch at Marina Park off Route 1 on Salt Pond Road, South Kingstown. Launch at Quonochontaug Breachway off West Beach Road, Charlestown. Launch at Westerly Town Beach overflow parking lot on the north side of Atlantic Ave.
Each year, our Salt Pond Safaris introduce dozens of kids to the wonders of the salt ponds. Using a 30' seine net, we will do our best to catch a variety of aquatic creatures to introduce to the children. The kids get hands-on experience with salt pond ecology--plan on them getting wet! Click here to see a Tidal Page article about safaris; click here to experience our interactive online safari without getting wet. We do require pre-registration for safaris as we can only comfortably accomodate about 15 children. Safaris meet at the Fish and Wildlife Service parking area at the end of the access road in Ninigret Wildlife Refuge, Charlestown, RI. Take the Ninigret Park exit off of Rt. 1 North, then enter Ninigret Park on the right about 1/4 mile later. Follow the access road all the way to the end. There are toilet facilities at the parking area. We will have a short walk on a flat trail to the pond (Grassy Point), out of sight of the parking lot, and will leave the parking lot at 10 AM. Please be there at least 10 minutes early to check in--we don't want to miss you! Safaris generally last about 1.5 hours. Please contact us at saltpondscoalition@gmail.com (or call 401-322-3068) for more information and to register. Third Monday of the month, 5-7 PM at the Kettle Pond Visitor Center in Charlestown, RI. 8/20/18(Monday), 7 PM: Please join us for SPC's Annual Meeting which will be held on the third Monday in August in the Kettle Pond Visitor Center in Charlestown, RI. Check back for more information as we get closer to the event! Click HERE to see the 2018 SPC Meeting Announcement and Proxy.